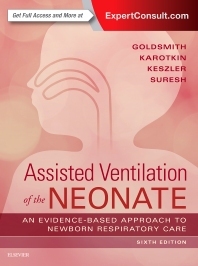 Extensively updated and featuring a new editorial team, the 6th Edition of Assisted Ventilation of the Neonate, by Drs. Jay P. Goldsmith, Edward Karotkin, Gautham Suresh, and Martin Keszler, continues to be a must-have reference for the entire NICU. Still the only fully comprehensive guide in this fast-changing area, it provides expert guidance on contemporary management of neonatal respiratory diseases, with an emphasis on evidence-based pharmacologic and technologic advances to improve outcomes and quality of life in newborns. A new full-color design and chapter layout combine for quick and easy reference. Covers everything you need to know about respiratory management in neonates: general principles and concepts; assessment, diagnosis and monitoring methods; therapeutic respiratory interventions; adjunctive interventions; and special situations and outcomes. Covers basic concepts of pulmonary pathophysiology and gives practical guidance on providing neonatal respiratory support with a variety of techniques, so you can learn both basic and advanced methods in one volume. Offers more than 30 appendices that help you quickly find normal values, assessment charts, ICU flow charts, procedure steps and other useful, printable forms.